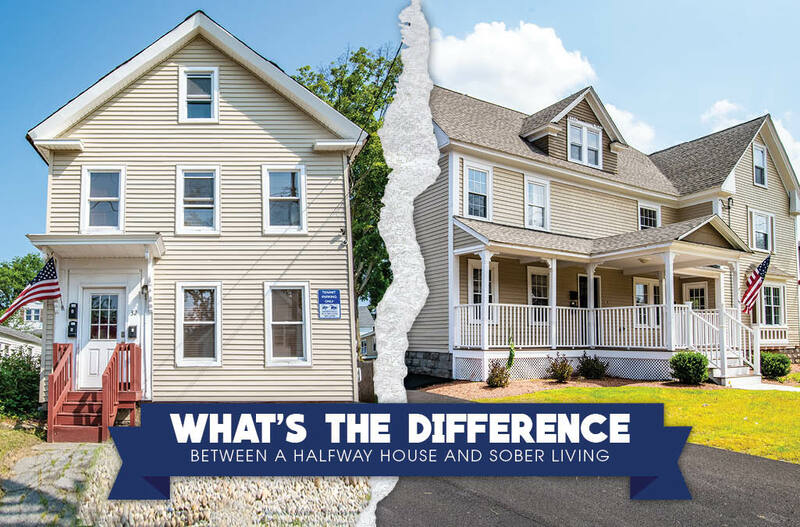 What’s the Difference Between a Halfway House and Sober Living? Halfway houses, sober living, and sober homes. When many people think that these terms are all interchangeable, there are some key differences when it comes to the details and the living environment you may need. How can you find a halfway house near you that will suit your needs? Could you possibly need to find a sober living house after leaving a PHP or inpatient program? There are many commonly unknown intricacies when it comes to halfway houses and sober living homes. A halfway house is a structured living environment for reintegration purposes. While there are many different types of halfway houses, some are strictly for people who have mental disabilities. Other halfway houses serve as the halfway point for convicted criminals to reintegrate into society but also have strict monitoring services. Halfway houses are more commonly for those in the beginning stages of recovery from alcoholism and addiction. If you are ready to pursue a life in sobriety but aren’t quite ready to transition to life at home, halfway houses are a wonderful option. Halfway houses are a transitional living home that is monitored and moderately structured. You can enter a halfway house after completing a medical detox, an inpatient or PHP program. Some halfway houses are self-pay options where you have to pay rent, maintain sobriety and keep up with essential life skills like chores. Halfway houses are self-admitting homes. You don’t have to be referred to a halfway house, while some people may be court ordered to a halfway house instead of more jail time. Halfway houses are sometimes referred to as “sober living homes” without any of the sober living affiliations. Most halfway houses aren’t participating with a treatment center to house addicts while they’re in an IOP or OP level of care. Halfway houses are often a separate entity. The length of time that you stay in a halfway home is completely up to you. The usual stay ranges from three to twelve months, although it is a personal preference unless there is a specific time frame for the halfway house where you must move out. Halfway houses have many rules. The rules are to maintain the integrity of the community in the house and to ensure that residents are maintaining sobriety. While rules may adjust throughout your stay at a halfway house, such as an extended curfew or case-by-case basis, there are many concrete rules in halfway homes. Random drug and alcohol urine analysis or breathalyzer testing. You must adhere to curfews. You must pay rent – this goes to the bills in the house for living there. You must attend 12 step recovery meetings – the fellowship is usually up to your choosing. You must have employment or at least be actively searching for a job. No drug or alcohol use is permitted or allowed in the house or on property. Attendance of any mandatory house meetings. Provide your own food and toiletries. While many of these rules seem like they are normal rules of life, they are sometimes things that we must relearn in our recovery process. In a halfway home you should be prepared to be supervised at times and to have to adhere to rules of the house. If you are court ordered to a halfway house, you will also have to meet all of your probation requirements while also adhering to the halfway house rules. A sober living home is often affiliated with a treatment center. A sober living home like this is where the treatment center has houses where the residents live and attend IOP or OP services at their facility. Having the affiliation with a treatment center is to keep accountability with the residents and have structure throughout the sober living house and clinical therapy. Sober living homes often require you to attend 12 step recovery meetings and get a sponsor to begin your step work. Other sober living homes are a privately-owned house where a collective of the residents run the house together. Similar to an Oxford House, these sober living homes also have a strict set of rules and often have blackout periods and strict rules about employment and paying rent. Sober living homes can also be a house that rents out rooms under the guise of being a “sober living home,” these are places to watch out for. These sober homes may not have any accountability or are better known as flophouses, which you should avoid at all costs. Always talk to people in the local recovery community if you are transitioning housing to find out if a sober living home is a safe place for you to be. The price difference between a good sober living home and a flop house is nothing compared to your life. While in an IOP house or OP sober living home, there are often more rules than a halfway house since it is affiliated with a treatment center. There is usually staff at the homes to help monitor to provide transportation to meetings (depending on what level of care you’re in), and typically weekly grocery shopping trips. While in a sober living house you still have to pay rent as that is not usually covered by insurance at that level of care. The same general rules apply to sober living homes as they do in halfway houses. While there may be more stipulations in a sober living house, they tend to be more structured. Must attend 12 step recovery meetings – with the rest of the sober living home or on your own depending on the level of care you’re in. The terms halfway house and sober living house are often loosely interchanged, there are differences. A halfway house is usually less structured and allows for its residents to have more personal freedoms while they maintain the necessities of sobriety to live in the house. Halfway houses are often the last step before moving out on your own. A sober living home is often for those that are still in some aspect of clinical treatment, like an IOP or OP program. Whether you are getting ready to leave a sober living home and go to a halfway house or researching for the next step you want to take after treatment, it’s best to listen to the professionals. If you are leaving an inpatient or PHP program, we recommend your next step is to go to a sober living home and continue treatment in an IOP program. When you are transitioning to a sober living home affiliated with an IOP program near you, ask your case manager to help you formulate the best aftercare plan. If you are transitioning from a sober living to a halfway house after completing an IOP program, it’s best to talk to people who are familiar with halfway houses near you. Talking to others in the recovery community and the clinical program could save you time and trouble of weeding out what the best options are for yourself. If you are looking to enroll in an IOP program with affiliated sober living, contact us at 855-448-3638. GateHouse Sober Community has safe, comfortable sober living homes to help you find your path to long-term sobriety.